performed works in this annual September concert format. The list includes a Sigmund Romberg operetta (The Desert Song), two operettas by Victor Herbert (Naughty Marietta and Mlle. Modiste), and two works by John Philip Sousa (Désirée and El Capitan). 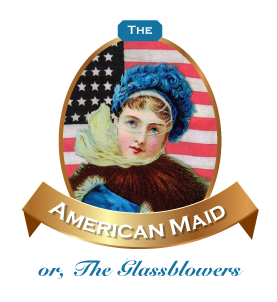 Now, we give you a third operetta by Sousa, The American Maid (alternate title The Glassblowers). Completed in 1909, but not produced until 1913, it is one of 15 operettas (six of them unfinished) that were composed by Sousa. We have William Martin and Jerrold Fisher to thank for finding and restoring the libretto and music that had been virtually lost for over 90 years. be the numerous march themes that Sousa incorporated in his operetta. In addition to Sullivan, it’s hard not to imagine that Sousa was influenced by other great composers of the late 19th century, such as Offenbach and Verdi...and throw in a little Rossini for good measure. Of course, Sousa could also write a darn good waltz, and you’ll hear numerous examples of that in this production. At the Vandeveers’ Fifth Avenue mansion, a reception is taking place. The honoree is the Duke of Branford, an English bachelor, the apple of everyone’s eyes – especially the social-climbing mothers and their debutante daughters at the party. Annabelle, the Vandeveers’ daughter, rebels at her social upbringing. She rejects a proposal from Jack Bartlett, a young dilettante millionaire. To prove his worthiness, Jack promises Annabelle that he will get a real job as a common laborer. He persuades Silas Pompton to hire him in his Consolidated Glass Works. Pompton and his wife meanwhile are in pursuit of the Duke for marriage to their daughter, Geraldine. Through a misunderstanding, the Duke is romantically involved with Annabelle. Bartlett and Geraldine, hurt and angry, on impulse announce their own engagement. In the midst of all of the romantic entanglements, word arrives that Vandeveer’s investments in the Cuban-American Iron Mining Company have been lost, wiping out all of Vandeveer’s money. Unknown to anyone, the financial collapse was engineered by Pompton. Annabelle, in an attempt to help her father convinces Pompton to hire her at his glassworks. Both she and Jack are to report the following morning. Two weeks later at the Consolidated Glass Works, Annabelle and Jack are at work. Jack has made great strides in winning-over his beloved by starting at the very bottom and working his way up. She is, however, still engaged to the Duke and Jack to Geraldine. Bartlett’s idea is to improve working conditions at the factory. This has made him very popular with the other laborers. Pompton fires Jack and Annabelle as troublemakers and the workers revolt. They are about to riot and bring harm on Pompton when Vandeveer enters with news that war has been declared against Spain and volunteers are needed. Everyone immediately and enthusiastically joins the movement to fight in Cuba. - O tell me, pray, what fault of mine?